Can primary nasal epithelial cells advance precision medicine for cystic fibrosis? Join us for an upcoming live webinar with Dr. Theo Moraes, who will discuss the use of nasal cell cultures as a physiologically relevant system for evaluating individualized drug responses. If you are unable to attend the live webinar, please register and we will send you a link to view the recording when it becomes available. 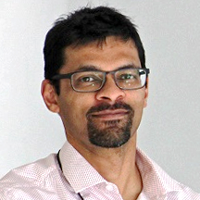 Dr. Theo Moraes is broadly interested in respiratory epithelial cell biology, with a major focus in cystic fibrosis (CF) and the use of primary cell culture models to improve the management of CF for individual patients. Dr. Moraes is a member of CFIT, a collaboration between Cystic Fibrosis Canada, SickKids Foundation, and The Hospital for Sick Children. The goal of CFIT is to develop a nationally accessible resource that will accelerate the development of precision medicine for people living with CF.